PHILADELPHIA (AP) — Bryce Harper turned Philly into a baseball city again with his star power, his slugging and a sweep. With a pair of mammoth homers making him at home in his new digs, Harper is now ready for a blast from the past. The six-time All-Star homered for the second straight game to cap a fantastic debut weekend and the Philadelphia Phillies completed a three-game sweep of the Atlanta Braves with a 5-1 victory Sunday night. Harper connected on a solo shot to right field off Shane Carle in the seventh inning that had the crowd resuming its “MVP!” chants from a day earlier and the Phillie Phanatic dancing atop the dugout. Carle then drilled cleanup hitter Rhys Hoskins on the left shoulder and was ejected from the game, and Phillies fans taunted him with a mock tomahawk chop. The sweep was complete — and now it’s time for an early reunion. Harper was the No. 1 overall pick by the Nationals in the 2010 amateur draft and was NL Rookie of the Year in 2012 at age 19. He was the 2015 NL MVP when he batted .330 and hit 42 homers. The outfielder left as a free agent for the Phillies and a 13-year, $330 million contract and digs in to an unknown fan reaction on Tuesday. “I’m sure some cheers, some boos as well,” Harper said. 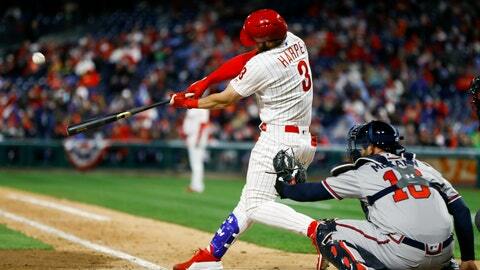 Harper was an instant fan favorite in his first series in Philadelphia, and his No. 3 jersey became a baseball best-seller. Harper wore Phanatic cleats, bowed to the crowd — and wowed them Saturday with a 465-foot homer for his first hit. Harper lined an opposite-field double off the left field wall in the third and had to hustle with a headfirst slide into second after watching the ball for a bit. Harper walked against lefty Max Fried in the fifth to load the bases for Hoskins. Harper was intentionally walked in the season opener to load the bases and Hoskins hit a grand slam. There was no slam this time, just a walk that was enough to score a run for a 2-1 lead. J.T. Realmuto followed with a sacrifice fly for a 3-1 lead in a hitless inning. “There are no weak spots in the lineup,” Arrieta said. The NL East champion Braves are the only winless team in baseball. Braves pitchers walked nine batters on Sunday, but the pitch that got away from Carle had everyone buzzing. Arrieta had the crowd roaring after he fouled off several two-strike pitches from Wright in the fifth. Arrieta lined out on the 11th pitch of the at-bat and earned a standing ovation. Braves: LHP Sean Newcomb takes the mound for the home opener Monday in the first of a three-game series against the Cubs.